I'm sure I put it down here somewhere: Is the coalition government enabling or isolating disabled people? Is the coalition government enabling or isolating disabled people? Photograph taken close up to a switch on a train. 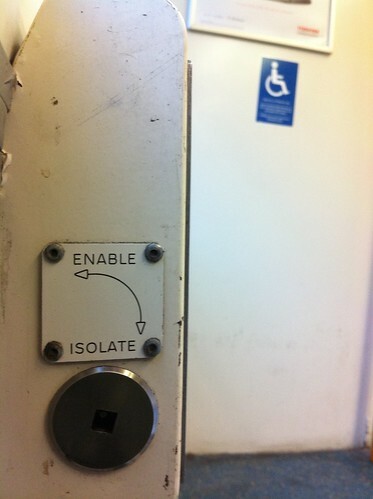 The switch is labelled "Enable" at the top, and "Isolate" at the bottom. Out of focus in the background is a wheelchair user symbol on the wall. The Welfare Reform Bill is currently being pushed through Parliament, despite strong opposition from the people it will directly affect, and from the House of Lords, medical professionals, social workers, allied health professionals, homelessness charities, disabled people's organisations etc. It is being pushed through because the UK government doesn't seem to care about improving the equality of sick, disabled, and disadvantaged people. It is based on flawed research, misappropriated academic models, misapplied and cherry-picked data, and the advice of a large health insurance company who have already been discredited in the US for similar behaviour. You can help stop these changes from happening. Write to your MP to voice your concerns about the changes.